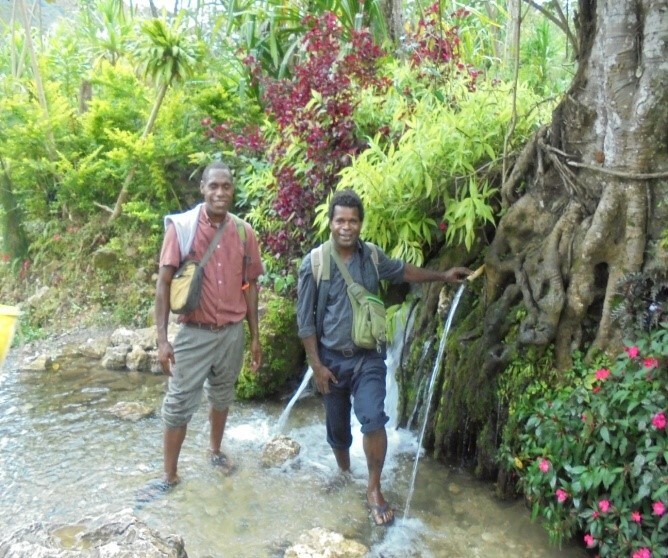 A native of Papua New Guinea risks tribal fighting to return to his village to share the gospel. 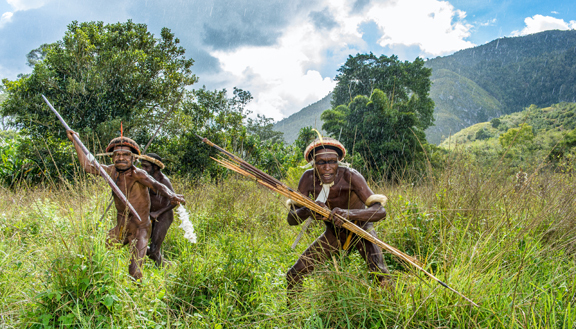 On its borders, it is a nation at peace; yet tribal skirmishes ravish the highland regions of Papua New Guinea. Disputes over land drag on for years, leaving decimated villages, bereaved families and homeless survivors. When tribal fighting broke out in Suawe Chimbu Province in 2010, 15-year-old Alex escaped to Kimbe, West New Britain Province. There he moved in with his cousin Paul, a Seventh-day Adventist who shared the messages of the three angels of Revelation with him. Brother Matthew and Pastor Michael traveling by foot. Alex kept busy with school and had no reason to return to Suawe Chimbu until 2016, when the Lord gave him a burden to share Bible truth with his remaining family. In constant danger of enemy fire, they needed the everlasting gospel! Alex asked me to accompany him to his village, and so on his semester break we hiked into the mountains with three other friends. Passing through the fighting zone, we reached Alex’s village just as darkness began to fall. We set up the sound system and played music to announce our Friday night program. Although our coming surprised the villagers, people began to gather! Matthew and Alex conducting Sabbath School program. Sabbath morning, ten souls attended Sabbath School and church with us—and we knew others could hear our message from their homes and fields. The Holy Spirit had already been working in the hearts of these ten attendees. After just one Sabbath, they were convicted and stated their desire to join the church. Even though Brother Alex lived in Kimbe, he still owned land in Suawe Chimbu. This he offered to the new believers to build a church shelter and a house for gospel workers to sleep in when they visited the new congregation. 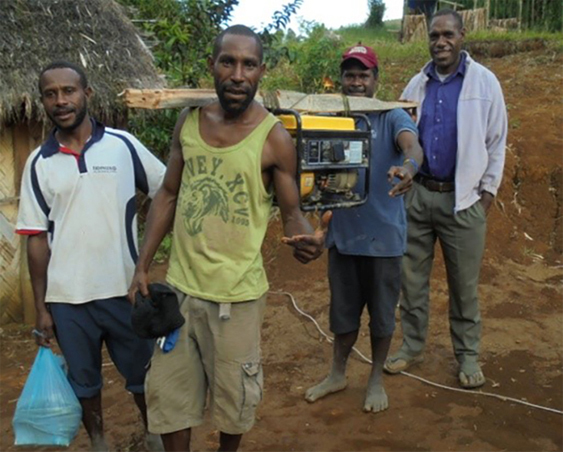 On Sabbath evening the boys went to another village to bring a big generator so we could show a PowerPoint presentation. We started that evening’s program with a message on health and continued with a gospel sermon. Praise the Lord—He brought all the villagers to that program. Everyone said they had never heard such a message, that the message of the three angels had given them real hope and true peace—blessings they had not found in their war-torn lives. Generator used in the meetings. Though short, our evangelistic meetings ended with good results. Souls embraced the truth, knowing that God had saved their lives during the years of fighting. They knew God was calling them to Himself, and they responded. When the time came for us to depart, we left a tearful village behind. To show their gratitude and their love for the everlasting gospel they had received, they each contributed a few coins and came up with enough for us to pay our bus fare once we reached the main road. With sad hearts, we left them, promising to keep in touch and to return when we could to nurture the church and help them build a good worship shelter. Our blessed hope is in Christ’s second coming. Let us work to win souls to Christ and prepare ourselves to meet Him! 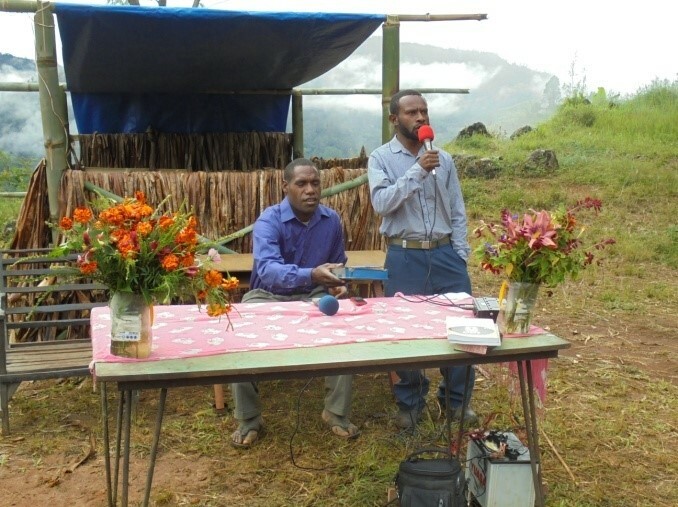 Brother Michael is a gospel worker in Papua New Guinea. Pray for the believers in Papua New Guinea to be united by their love for Christ and His appearing. Pray for the new converts to keep their eyes on Christ so they can share His peace in their strife-filled villages. Pray for more workers to go to spiritually impoverished areas and proclaim God’s last-day message of warning and hope.